In August, I was privileged to be inducted into the Susan M. Daniels Disability Mentoring Hall of Fame by the National Disability Mentoring Coalition (NDMC). I was honored over the fact that mine was the first induction ceremony to be organized for an individual. Held at the U.S. Department of Education and including attendance by the Department’s leadership, I was grateful for everyone’s support. To my surprise, roughly a week or two prior to the ceremony, I learned that I was nominated by Leo, one of the three blind triplet boys to whom I was once a mentor but to whom I am proud now to be their Dad. Most recently, on September 23, a HeartThreads video that tells our story went viral, being viewed more than 726,000 times within the first 48 hours of its release. Several days before that, on September 20, the boys becoming Eagle Scout was the central focus of an article in USA Today online. In thinking about the cause of mentoring, it occurred to me that related efforts represent a kind of “passing of the torch.” When we each look back on our lives, we invariably see that the advantages that we enjoy today were put into place by those who came before. Names, once well-known especially to peers, may end up blurring over time except within the context of our learning notable luminaries as described in history textbooks. And yet, though we may not ever fully know all the names of those whose pioneering work led to the things today that may be easily taken for granted, nothing may detract from the fact that their impact on us, both individually and collectively, is simply undeniable. Those of prior generations are our progenitors from whom we have INHERITED what we have and, just as we build upon their legacy to us, through the way we each live our lives, our chance to facilitate impact on the next generation is now. We are to be the newest foundations on which future generations are to build. The defining question is what we will do with that sacred responsibility. Will we squander the chance by doing less than what we know we can do or otherwise leaving the work to someone else, or will we instead grab life by the horns and leverage it for all that it is worth in order ultimately to leave the world better than we found it. You and I are most certainly dedicated to the latter course. We each know, as Susan did, the truth behind our inherent power to make this world a better place indeed. Within the broader scope of eternity, we are well aware of the fact that our time, at most, spans a little more than a century. As such, there is no better time than the present to make our efforts count. I can think of no better way to doing that than by mentoring. Think about your own lives. Invariably, there are people who have come across your path, who have impacted you in ways that they themselves may not have realized or may never realize. And yet, the absence of their knowledge about such an impact on you does not detract from the reality of its immense and positive power. Those individuals are the ones who had an influence on you in unique and special ways that no one else ever has or ever will. With the gifts of knowledge, insight, perspective, talents, abilities, skills, know-how, and more, the qualities that you saw in your own mentors are now the qualities that have become a part of who you are. In effect, their legacy, always and forever, lives on in you. As you impart unto others what you yourselves have learned through trials and triumphs, mistakes and magnificence, hindsight and foresight, and goals failed and glories achieved, your personal strength of character lends itself to what you share with those who come to rely on you for your sage counsel and your invaluable perspective. We are well aware of how mentoring can take place within the home, in the classroom, at the workplace, in the pursuit of a hobby or interest, and within the broader community. We may be mentors within one setting while gaining the benefits of being protégés in another. In addition, mentors and protégés may serve both to teach and to learn. Through such dynamics, not only does each grow, but so does the incredible potential that comes with expanded ways of thinking as new lessons take hold and become a part of each person’s DNA. As synergy results from regular interaction that gives rise to each person gaining amazing new perspective that would not or could not have occurred otherwise, new and decided courses of action stand to set into motion a ripple effect that results in even greater value being added to all those who are fortunate enough to be within their respective spheres of influence. And yet, for far too many (and, as far as I am concerned, ONE is “too many”), they are still shackled by limited beliefs and expectations, based on old and outdated stereotypes about disability. These individuals are the recipients of a legacy of a different kind — namely, one which is characterized by the tragic cycle of limited expectations leading to limited results, which simply end up reinforcing the limited expectations. For these individuals with disabilities, the cycle is not one of progressive improvement but rather one of stagnation and under-utilization of the greatness that lies within them. Persons with disabilities and our allies are to stand together to foster true and lasting change, knowing that such a legacy of leadership, built by champions like Susan M. Daniels and others, is now OUR birthright. We know that the mantle has been passed to US, and we will not fail to deliver on our promise to our forbearers and to children, who are not yet born, to whom WE are to be forbearers ourselves. The reason why I am certain of the movement being in good hands is because of the efforts in which we are all engaged to spread the cause of disability mentoring everywhere we go. The NDMC has been organized precisely to bring together stakeholders from all quarters and to unite efforts to advance mentoring in all settings so that we as members of the disability community may continue to strengthen our individual and collective voices for the good of those around us. We do so, remaining fully aware of how any failure on our part to pass along what we have learned will represent an irretrievable loss but concurrently recognizing how our success in passing to the next generation all that we know will result in the dawning of a new age in which we as persons with all types of disabilities are to enjoy greater independence, higher achievement, and new levels of success within every human endeavor, the likes of which have never before been known! Picture of Leo Cantos hugging his Dad after providing remarks on the impact of Ollie’s mentorship on him and his brothers, Nick and Steven. Photo Credit: Joshua Hoover, Department of Education. So all this begs the question: “What next?” Within NDMC, we see example after example of individuals and organizations whose work in the field of disability mentoring has had indelible impacts on the lives of those who had the fortune of being associated with them. This has been the case among children, youth, young adults, and budding professionals with disabilities. As each has something to learn, each has something to teach. But, as many of us as there are who are dedicated to mentoring, our ranks remain far insufficient when looking at the daunting task that lies before us. Kids in school need someone personally to believe in them and, yet, many are lacking that special connection that lights the sparks of high expectations, positive beliefs, and commitment to ongoing improvement that are to last a lifetime. Students are not always exposed directly to successful people with disabilities who may serve as their role models and whose qualities they themselves may strive to emulate. Job-seekers with disabilities lack job-shadowing opportunities that could advance hands-on career exploration and practical work experience that may serve to refine chosen goals and inculcate in them a deep sense of what is truly possible with the right degree of preparation, both hard and smart work, and follow-through, all the while learning to adhere to the highest standards of personal accountability. These are but a few illustrations. However, they underscore how the solutions lie both in increasing our numbers and in enhancing our own personal efforts. As NDMC continues to bring together established and promising best practices in the field of mentoring, our ability to do good by doing well will pave the way for further quickening of our momentum toward creating a world in which every person with a disability who stands in need of a personal or professional mentor will know how and where to secure the support needed to enable him or her to take life to a whole new level of fulfillment, accomplishment, and success. If we may succeed at attaining this ideal, our legacy to those who will follow us will be a noteworthy one indeed, and the cycle will in turn repeat. Editor’s Note: Ollie Cantos currently serves as the Special Assistant to the Acting Assistant Secretary, Office for Civil Rights, US Department of Education. The following citation was read at the Induction Ceremony. Also, please visit Ollie’s Hall of Fame page! 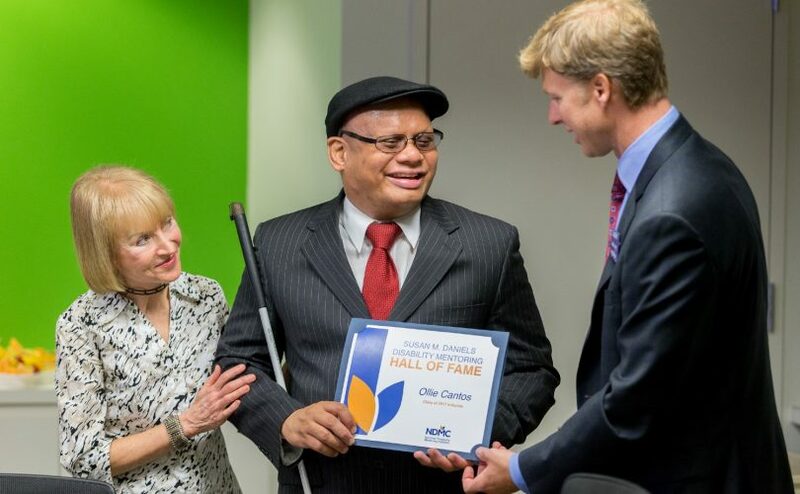 As a blind Filipino-American, Ollie has successfully navigated his education, career and personal pathways. From being bullied as a child and lacking in self-confidence, to becoming one of the highest ranking officials in the US government, Ollie has blazed a trail that has inspired countless other individuals to dream big and make their dreams come true. As Ollie’s colleagues at the U.S. Department of Education, you may be aware of his career in federal service, which includes serving as Special Counsel in the Civil Rights Division of the U.S. Department of Justice, Associate Director of the Domestic Policy Council at the White House under President George W. Bush, and Vice Chair of the President’s Committee for People with Intellectual Disabilities. But you may be less familiar with Ollie’s work outside of the public arena. Ollie has spent years as an advisor to assist organizations working to support low income, at risk populations and on the spectrum of disability-related issues. He was also the first blind person in history to serve as “District Staff Officer– Legal Parliamentarian” in the United States Coast Guard Auxiliary. Throughout his life, Ollie has devoted himself to mentoring. He has served as a long-time attorney mentor for the American Bar Association Commission on Mental and Physical Disability Law and has been a Big Brother mentor to a youth from Los Angeles who has just completed six years of military service in the US Air Force. In addition, Ollie has mentored African-American foster children living in Washington, DC. And now mentoring has become the bedrock of Ollie’s family life, at the center of which are three blind triplet boys — Leo, Nick, and Steven. Starting off as their mentor in 2010 when they were just 10 years old, Ollie eventually adopted the boys who now call him Dad. The boys recently graduated from high school, and all three are now working full-time. They all plan to attend four-year colleges, with two wanting to become attorneys and the third aspiring to a business career. 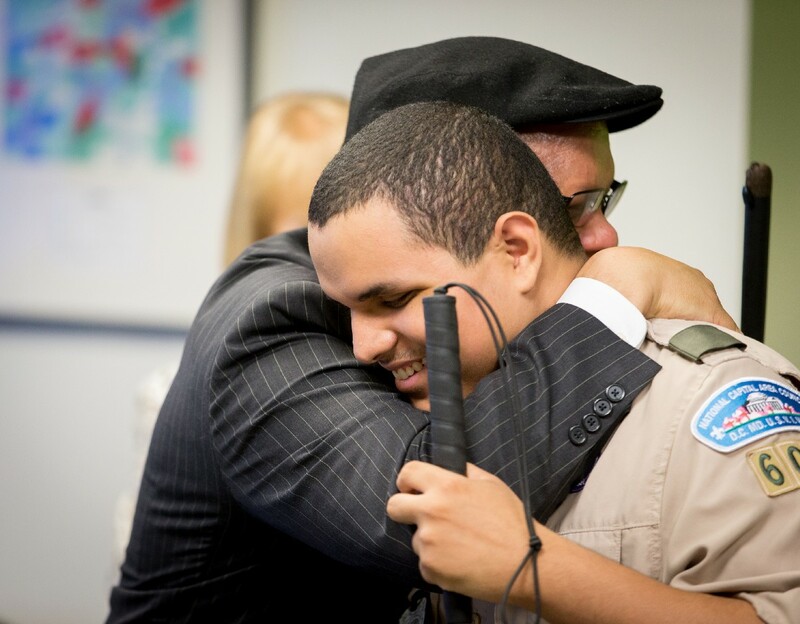 By adopting his sons, Ollie took on the ultimate responsibility, moving from mentor to father. With Ollie, service and giving back to help others define who he is as a person and what he teaches us all. Ladies and gentleman, in recognizing his life-time commitment to improving lives through mentoring, we are honored to induct Ollie Cantos into the Susan M. Daniels Disability Mentoring Hall of Fame.